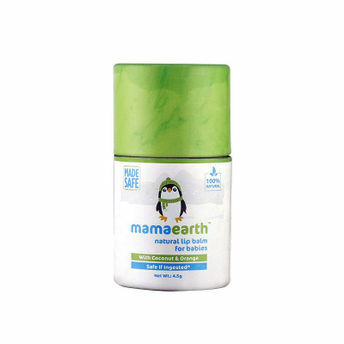 Mamaearth's Natural Baby Lip Balm for Babies is enriched with coconut oil, cocoa butter and orange. This 100% natural baby lip balm keeps your baby's sensitive lips thoroughly moisturised and hydrated all day long. Calendula extract with orange oil nourishes and protects lips from dryness and chapping. Natural beeswax locks in the moisture and keeps lips supple throughout the day. Made with natural beeswax, it also retains moisture and helps keep lips supple throughout the day! MadeSafe certified and dermatologically tested, this lip balm is completely safe and is free from petroleum jelly, paraben, silicones, artificial flavor or color.